Welcome to the fourteenth issue of the Columbia College Class of 1963 eNewsletter. Sorry that the Class eNewsletter is so late this month (and is so brief), your correspondent finds himself stretched impossibly thin this April. I should have most of my distractions behind me by May, and promise to do better for you. March's luncheon was extremely well attended, see the notes below for details. This months lunch will be on Thursday, April 20. Future gatherings are scheduled for May 11, June 8, and July 13. The Third Annual Parade of Classes will be on Tuesday, May 16 (Class Day) at Columbia. Each of the last 50 graduate classes marches proudly holding their Class Flag. Last year, I was the only 63er there, and we had to borrow a ringer from the Alumni Office to hold the other end. (See last June's eNewsletter for pictures.) So, consider this a plea for any of you to join me. We meet at Lerner Hall (in the Satow Room) at 8 AM for a great Continental Breakfast. March with the flags, and then enjoy great Class Day speeches. Let me know if you are going to join me. I know that there must be many more who have lost contact with Columbia. If you know how to contact any of these classmates, please let me know. And send me the names of any other missing friends, and we will try to find them. Please join your classmates for an informal lunch at the Columbia Club every second Thursday of the month. It is our hope that these gatherings will renew old friendships and foster improved relationship with our class and the College. This month, Thursday, April 20, 2006. The fourteenth Second Thursday Class of 1963 lunch was held on March 9. 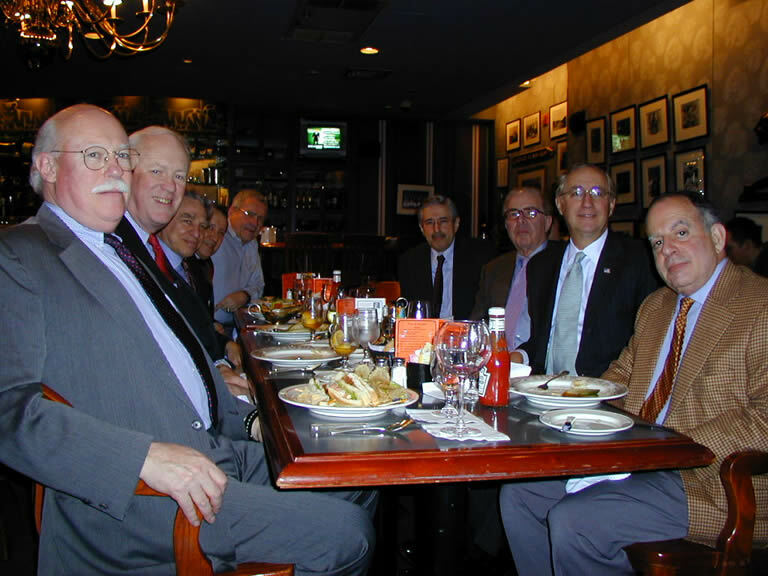 Many of the regular Second Thursday Club members showed up, including Jeff Thompson, Larry Neuman, Harvey Schneier, Tom O'Connor, Doron Gopstein, David Saxe, Bruce Kaplan, Peter Broido, and Paul Neshamkin. It was David's first lunch, and Peter came in all the way from Chicago. A great group. Here once again are portraits of the happy gathering (it was such a large group we needed a shot from each side to do it justice). 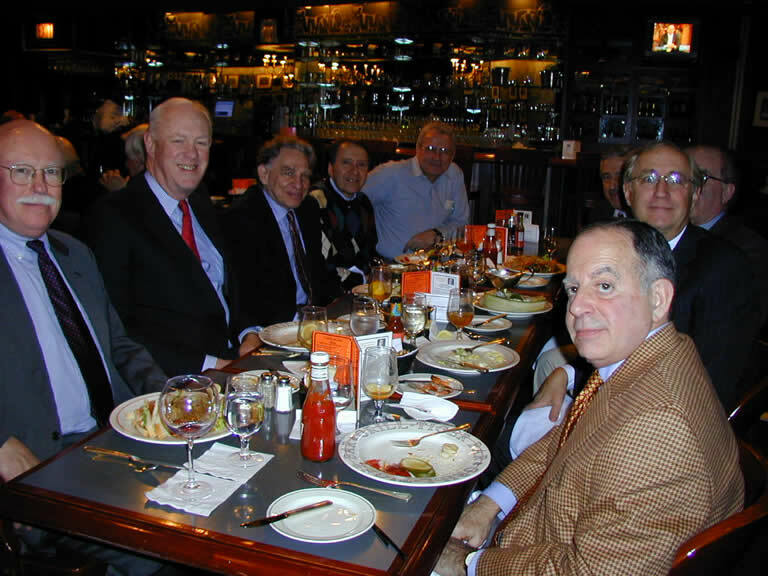 (From left to right): Paul Neshamkin, Jeff Thompson, Larry Neuman, Harvey Schneier, Tom O'Connor, Doron Gopstein, David Saxe, Bruce Kaplan, and Peter Broido. Click here if you would like to see some additional candid shots. I hope you can all join us (please encourage your friends to come with you) at the next lunch on Thursday, April 20. Let me know if you will attend so that we can reserve a big enough table; RSVP to Paul Neshamkin (pauln@helpauthors.com). Mel Gurtov writes, "I have a new book out -- my 20th, actually -- entitled Superpower on Crusade: The Bush Doctrine in US Foreign Policy (L. Rienner, publisher), a critical exploration of the Bush foreign policy and an argument for moving to a "humane internationalism" based on respect for international law and institutions, human rights, a real security at home." Mel is a professor of Political Science & International Studies at Hatfield School of Government, Portland State University, and Editor-in-Chief, Asian Perspective. I'm still waiting to hear details from Peter Gollon of his Costa Rica trip (with wife and family) and business trip to Hong Kong. Peter, send us some pictures! And try to make a lunch. Which reminds me, I still haven't heard back from Mike Hassan, who promised to fill us in on his trip to the Sudan (Mike has been living and working in Nairobi, Kenya). It's been almost 5 months, Mike, we hope you're OK! I had written Herb Soroca to ask him if he was making last month's Crew Banquet, and to see if he was interested in rowing the Head of the Charles next Fall in a Columbia veteran boat, he responded, "On my way to Boston to visit son, daughter and grand-daughter. Would love to row an over 55 8 at the Charles. Count me in." Anyone out there interested? Let me know. I was hoping to do it myself, but the way the back feels right now -- no way.